My education in Graphic Design has just begun, but I’ve already discovered a love for typography in particular. 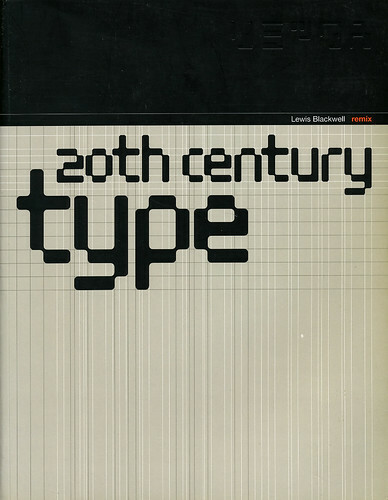 The book I chose to review examines typography in the 20th Century, starting with 1900 and delving into each decade separately, ending with the 1990s. The trends and innovations in typography discussed in the book are paired with historical events, cultural shifts, and invention that occurred during that time. Major points in history are touched upon, including the Industrial Revolution and the advent of mass production, warfare and propaganda, the emergence of youth culture in the 60s, all the way through the modern age of digital technology and non-print media. The author provides beautiful examples of graphic design within each decade, as well as strictly typographic examples, complete with type name and size. Art movements pertaining to the examples and points in history are discussed as well. What I love about this book is how the author successfully illustrates the fact that typographic and graphic design trends are always changing, and that they are impacted significantly by what’s going on in our world. Conversely, typography and graphic design can be powerful tools that have been – and continue to be – used to spark emotion and action within people living in these volatile time periods.